Be the first to share your favorite memory, photo or story of Pastor Thilbert. This memorial page is dedicated for family, friends and future generations to celebrate the life of their loved one. Rev. Thilbert Denton Gifford, 74, of Elk City, Oklahoma was born on April 11, 1944 in Granite, Oklahoma. He is the son of Don and Jewel (Evans) Gifford. He went to be forever with his Lord and Savior, Jesus Christ on Friday, January 11, 2019 in Oklahoma City, Oklahoma surrounded by his loving family. He grew up in Granite, Oklahoma and graduated from Granite High School. After graduation he attended Southwestern Assemblies of God University in Waxahachie, Texas. Thilbert married his best friend and sweetheart, Judy Kay Lacy on April 8, 1966 in Oklahoma City, Oklahoma. To this union, two sons were born, Bradley Denton and Brenton Don. He was a credential Assembly of God minister for fifty-three years. At the age of twenty-one he began pastoring the first of six churches in Colorado. He pastored at three churches and was the youth pastor at Pueblo First Springfield and Sunset Assembly Lasalle (Greely Area). He pastored Frederick, Granite First Assembly and Elk City First Assembly of God in Oklahoma. Thilbert loved building and construction work. He was blessed to be able to oversee and be the general contractor for the new building for the First Assembly of God Church in Elk City. He had a heart for missions. Thilbert traveled to over thirty-five countries in Europe and South America preaching, teaching and building churches and schools. He was an avid student of the Word of God and a mighty man of prayer. Thilbert was a man of high standard and moral character. He loved serving the Lord, pastoring churches and loving people. Funeral services will be held at 10:00 a.m., Tuesday, January 15, 2019 at the First Assembly of God in Elk City, Oklahoma. Pastor Brent Gifford will officiate. Interment will be at Fairlawn Cemetery in Elk City, Oklahoma. 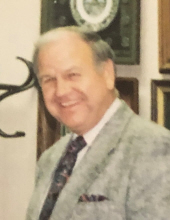 Services have been entrusted to the care of Martin-Dugger Funeral Home in Elk City, Oklahoma. He is preceded in death by his parents, two brothers; one sister; one great granddaughter. We love you papa. Enjoy heaven. See you soon. Memorials can be made to The Link Church Missions department in care of Martin-Dugger Funeral Home, P.O. Box 707, Elk City, Oklahoma 73648. To send flowers or a remembrance gift to the family of Pastor Thilbert Denton "T.D." Gifford, please visit our Tribute Store. "Email Address" would like to share the life celebration of Pastor Thilbert Denton "T.D." Gifford. Click on the "link" to go to share a favorite memory or leave a condolence message for the family.